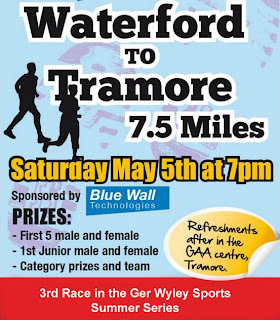 The 43rd Annual Waterford to Tramore 7.5 mile road race is coming up on Saturday, 5th May 2012. This is the third race in the Ger Wyley Sports Summer Series. This race begins outside Waterford City Hall in Waterford at 7pm sharp and finishes opposite the Majestic Hotel in Tramore. Note that runners need to organise a lift back to Waterford to collect your car. Changing and shower facilities plus refreshments and prize-giving will take place in the Tramore GAA clubhouse after the race. You can also enter on the night for €12 at the Munster Bar, on the Mall (which is near both the Tower Hotel and only minutes from the start) between 5:45pm and 6:45pm. Those who have pre-entered can collect their number in the Munster Bar at the pre-entered section. The organisers of the race have asked that all runners register online prior to the race as this will speed up proceedings on the night.